Global brands are reportedly funding Islamic extremists, pornographers and white supremacists by unwittingly advertising on their websites. 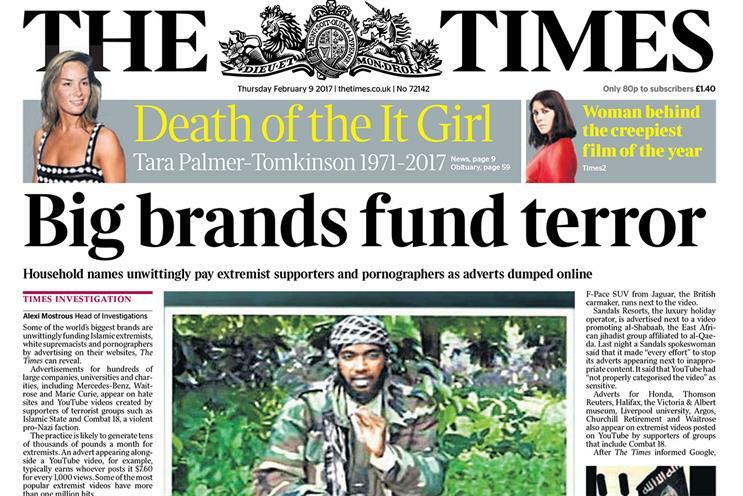 The Times reports the ads are likely to generate tens of thousands of pounds for extremists, with an ad alongside a YouTube video generating $7.60 for every 1,000 views. Blacklists designed to prevent such ads from appearing on extremist sites are not fit for purpose, according to an analysis by The Times. It cited a YouTube ad for the new Mercedes A-Class that ran next to a pro-Islamic State video which was viewed more than 115,000 times. There is also a Sandals Resorts video that appeared next to a video promoting East African jihadist group Al-Shabaab. The report comes after Procter & Gamble's global chief brand officer urged the marketing industry to come together to tackle media transparency. In a speech to the US IAB in Florida on 30 January, Marc Pritchard said: "We have a media supply chain that is murky at best and fraudulent at worst. "We need to clean it up, and invest the time and money we save into better advertising to drive growth. It’s time we come together, put down our finger-pointers and solve these problems – all of us – marketers, agencies, publishers, ad tech platforms, suppliers." The Times said many of the companies said that they were unaware of and "deeply concerned" by their presence on the sites and blamed programmatic advertising for the placement of the online ads. A Google spokesman said: "When it comes to content on YouTube, we remove flagged videos that break our rules and have a zero tolerance policy for content that incites violence or hatred. Should brands pull ads over editorial coverage?